Serge Torrano was born at Sorède in the Pyrénés Orientales on February 17th 1950 into a Spanish family that had fled to France after the victory of Franco. At the age of 18 he was working as a welder in a factory in the region. He took part in his first strike there and shortly after moved to Paris. Taken on by the SNCF (French rail) in 1969, he worked as a switchman out of the Gare d’Austerlitz. He carried on an active role as a workplace militant there for the next forty years. He was also deeply involved in activity in the neighbourhood joining the Jules Vallés group of the Organisation Revolutionnaire Anarchiste in 1971. Among the militants active in this group were Anne and Daniel Guerin, Ramon Finster, Michel Ravelli and Gérard Mélinand (see the biographies of Daniel Guerin, Finster, Ravelli and Mélinand here at libcom). He took an active part in bringing out the local newssheet of the group Le canard du 13ème (1972-1982) and also had an active role in an adventure playground in the arrondisement, also being involved in its newssheet, Terrain d’Aventure. A militant of the base, he refused to climb in the union hierarchy. He and Claude Beaugrand founded the group of libertarian communist railway workers based around the paper Le Rail Enchaîné ( at least 8 issues from April 1973 to1976). After training at the ORA printshop Edit 71 in 1972, Serge was a member of the commission bringing out the ORA paper Front Libertaire. He also contributed to the theoretical magazine Pour (2 issues 1975-77). He also attended most of the congresses of the ORA. 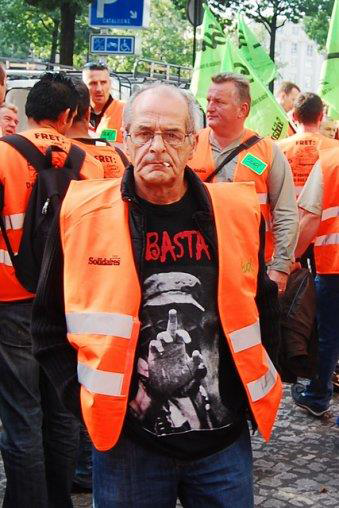 He was one of the majority of the ORA which supported the “ultra-left” turn in supporting the autonomists in Paris. This culminated in the expulsion of the tendency that later became the Union des Travailleurs Communistes Libertaires (UTCL- later morphed into Alternative Libertaire) at the Aril 1976 congress of the ORA. The ORA then changed its name to the Organisation Communiste Libertaire (OCL). The OCL experiment with the autonomous movement was a failure and Serge turned back to workplace militancy, leaving the OCL in 1979. Serge took a leading role in the SNCF strike of winter 1986-7. This saw coordinations of strikers for the first time. Serge supported the creation of a Coordination Nationale Intercatégorielle (National Cross-Category Coordination). As a result he fell out with railworker militants of the UTCL who believed he was being manipulated by the Trotskyist group Lutte Ouvriere. He also fell out with the union bureaucracy, who threatened him with sanctions for his support of the coordinations. He was one of the organisers of the group of more than 200 railworkers who joined the student demonstration against the murder of Malik Oussekine by the police on the night of December 6th 1986. In the same period he participated on Chroniques Syndicales broadcast over Radio Libertaire, the radio station of the Federation Anarchiste. He took part in the strike against the attacks on pensions in 1995. The following year he left the CFDT union and was a founder of the base union SUD Rail. He retired at the age of fifty five in 2005, continuing to take part in many struggles in the Paris region, joining actions of the student movement, of housing groups and of sans papiers (unregistered immigrants). In 2014 he returned south and settled in Agen. Here he joined Alternative Libertaire. He suffered a heart attack on March 13th of this year. He appeared to be making a recovery and joked that he would not be able to outrun the police anymore. Unfortunately this respite was brief and he died shortly after on March 30th. Another fine militant well-remembered. I too Nick, am immensely enjoying your growing collection of remembrances of those who have given everything in the struggle for a better world, All credit to you in gathering these stories together here. It was a different ORA, in North London, that I recall as first running in to you-glad that you are still hard at it. Nom De Plume, I have removed your last comment. Please don't disclose your personal address and phone number on this public website! Feel free to communicate with battlescarred via private message.